Starting a successful and effective clinical LCS program is a complex endeavor that requires careful coordination of many clinical and administrative activities. General elements required for program initiation have been previously described in Recommendations of ATS/ACCP policy statements on implementation of LC. However, as with any complex process, the details are important. There are many questions which arise in planning an LCS program that are incompletely addressed in the published guidelines referenced earlier. The answers to the questions below provide practical guidance to commonly encountered implementation issues and are answered by the panel. Participating panelists from centers around the country are outlined in Panel Profiles and Organizational Structure which allows the reader to understand the environment the panelist is working in and how their program may differ from those at another institution. LCS programs generate activity across multiple departments throughout an organization. Accounting for these diverse sources of downstream revenue can be challenging but necessary when seeking to secure resources for program implementation. Additional considerations for engaging senior leadership beyond the proven mortality benefit to the high-risk population are addressed by the following questions and responses. How did you gain support from your administration when setting up your LCS program? AM: Armed with the ground-breaking results from the NLST and the newly-released NCCN LCS guidelines, physician and administrative members of our multidisciplinary steering committee educated our senior administration about the net benefit of LCS for the high-risk population at various time points and settings including one-on-one conversations and formal group presentations. We highlighted the power of LCS to save lives and decrease morbidity while simultaneously mitigating our institutional legal liability. We also provided our senior administration with a forward looking business analyses projecting potential hospital activity/volume resulting from LCS under a variety of scenarios. CCT/AR: Our program leaders worked with senior leadership in oncology, radiology, and pulmonary to synthesize the evidence and evaluate the financial impact of such a program on the organization. 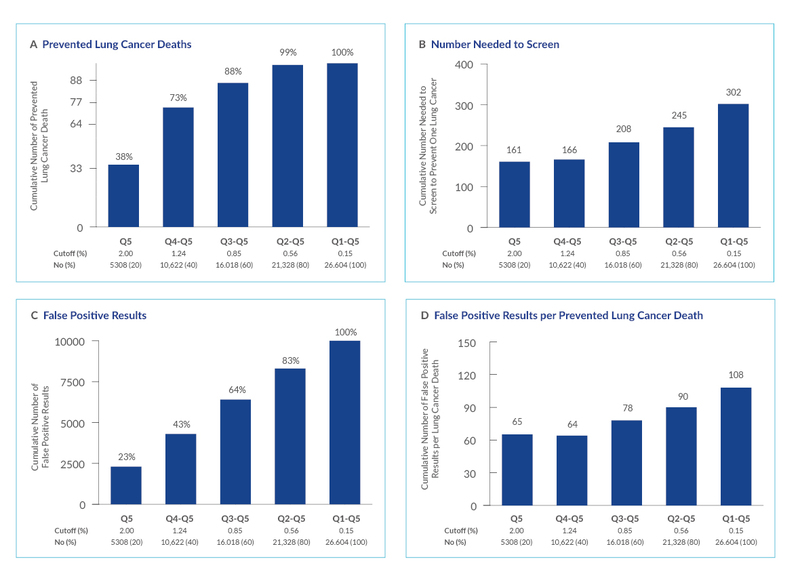 We assessed ACO financial data on the lung cancer diagnosis as well as therapies and evaluated leaks from our program with a plan for improved retention of patients from the point of screening forward utilizing a multidisciplinary team and navigator. We also used evidence of the risk of loss to follow-up and the need for a surveillance system in addition to an LCS program. This is a huge area of concern for primary care and ordering providers across the organization and our screening program was proposed in conjunction with a robust mechanism to track incidental lung nodules as well and to provide surveillance. CF: Making the case to provide an LCS program through our practice was a challenge. We met with administrations and reviewed the data regarding LCS to establish a need for such a service. We are a large multispecialty group affiliated with but separate from a local hospital system. The sources of “downstream” revenue for our group are limited, i.e., we do not directly provide chemotherapy, radiation therapy, or receive the facility fee for surgeries. However, there is a strong incentive for administration to prevent “leakage” of patients from the practice. We were able to get backing by emphasizing that a program was the right thing to do for our patients, to ensure that screening is discussed and offered to appropriate high-risk patients, and also to ensure that patients without a clear benefit are not unnecessarily exposed to the risks of screening. It was also emphasized that if we did not offer an internal screening program our PCP’s would still need to discuss LCS with appropriate patients and if screening was to be pursued it would require referring them to a program outside our practice and our affiliated medical center. 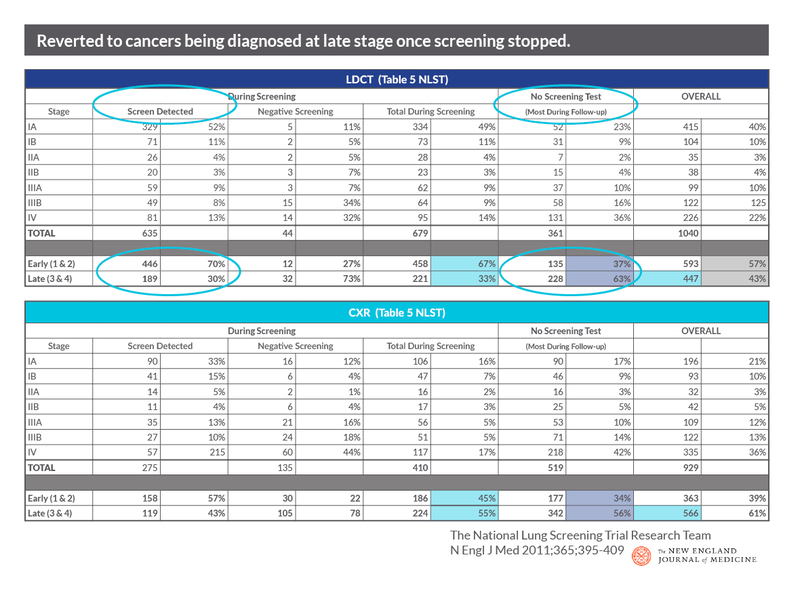 LCS is the only cancer screening test to reduce overall mortality. Why cancer screening has never been shown to “save lives”–and what we can do about it. 100-120 men will have at least 1 false-positive result. 110 men will be diagnosed with prostate cancer. 29 men will develop erectile dysfunction as a result of treatment. 18 men will develop urinary incontinence as a result of treatment. 0-1 deaths from prostate cancer will be prevents. Source: Adapted from the 2012 US Preventative Service task Force recommendation statement . 510-690 women will have at least 1 false-positive result. 60-80 women will have a false-positive result that leads to a biopsy. 23 women will be diagnosed with breast cancer. 11 or fewer women will be overdiagnosed with breast cancer. 0.1-1.6 deaths from breast cancer will be prevented. Source: Adapted from Welch and Passow . 365 Particpants has a t least 1 false-psitive result. 25 participants had a false-positive result leading to an invasive procedure. 3 participants had a false-positive result experienced a major complication of a procedure. 3-5 particpants were overdiagnosed with lung cancer. Approximately 3 deaths from lung cancer were prevented. 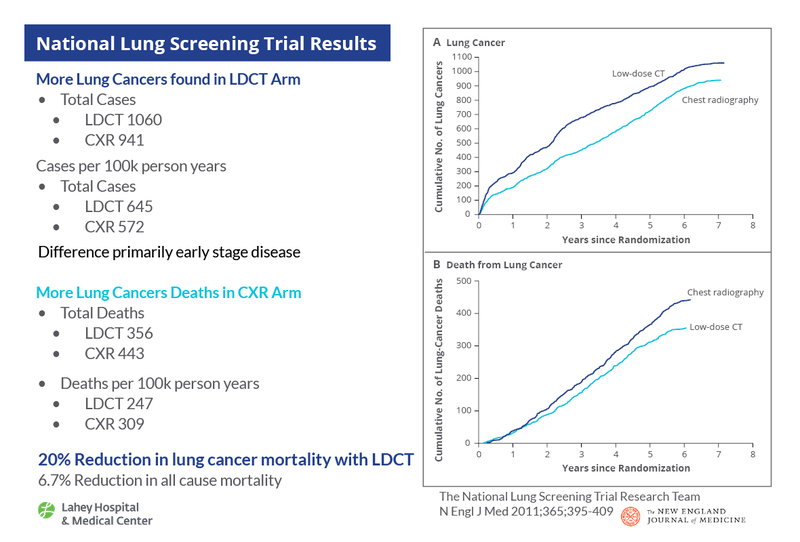 Source: Data from the National Lung Screening trial Research Team  and Patx et all . Comparison of Benefits and Harms of 3 Controversial Cancer Tests. Development of a Multidisciplinary Steering Committee can serve as a powerful coalition to guide program development, provide a forum to establish consensus, and promote a team-based approach to overcome obstacles to program implementation. The following descriptions derive from a survey sample of project panelists. Provide a description of your program, including its structure and governance. AM: The Rescue Lung, Rescue Life LCS program at Lahey Hospital & Medical Center is a hybrid program with decentralized referral and centralized tracking. It is managed by a multidisciplinary steering committee consisting of representatives from radiology, radiation oncology, pulmonary medicine, thoracic surgery, medical oncology, internal medicine, pathology, marketing, philanthropy, and administration. Co-chairs of the steering committee are from the departments of radiology and oncology. The steering committee responsibilities are to set high-level program structure, define roles and responsibilities of personnel, define high-risk populations, garner administrative and service line support, define quality metrics, oversee outreach initiatives, agree on policies for medically inoperable patients, and work together to remove barriers to increase patient access. Since the program’s inception in 2012, we have performed over 13,000 exams on 5,000 high-risk individuals. We currently perform 60 LCS exams per week, with full capacity estimated to be ~100 scans per week. AR: The Lung Health Screening program at Christiana Care Health System began enrolling eligible patient in the spring of 2015. This was done in a joint effort with the state of Delaware’s Screening for Life Program that was already performing screening for the uninsured in the areas of colon, breast and prostate. Other healthcare facilities in the state worked in concert as well. The program is centralized and all orders and shared decision making are conducted by the program. The steering committee consists of leaders in radiology, pulmonary, thoracic surgery, IT/statistician, primary care representatives, smoking cessation counselor, along with the nurse navigator. The responsibilities of the steering committee are to set high-level program structure, define roles and responsibilities of personnel, define high-risk populations, garner administrative and service line support, define quality metrics, oversee outreach initiatives, agree on policies for medically inoperable patients, and work together to remove barriers to increase patient access. Currently with about 2,000 enrolled over the past two years and it will grow as needed. CCT/KK: The Mount Auburn Hospital LCS and Nodule Management program is a hybrid program with decentralized referral and centralized management and tracking of findings. Providers can elect to refer directly to the program for evaluation and entry into the program in a centralized manner. The electronic health record (EHR) triggers a best practice advisory for eligible patients and the order is placed by the provider following SDM and smoking cessation counseling. Eligibility is verified centrally. The program is managed by a multidisciplinary steering committee consisting of key experts in pulmonary, diagnostic and interventional radiology, radiation oncology, thoracic surgery, oncology, pathology, and coordination through a nurse navigator. The program is supported by monthly review of key metrics by an Oncology Steering Committee led by the hospital CEO with members including chairs of medicine, radiology, and chiefs of oncology, radiation oncology, pulmonary, and representation from surgery, development, and fiscal management. Central program staff includes a medical director, radiology director, a nurse navigator, and key support from operations in radiology and IT. A smaller steering committee exists for our LCS program and includes the director and assistant director of the program, the radiology screening program director, the nurse navigator, and the chief of oncology. This group develops major initiatives and opportunities for quality control and growth. Logistic and operational issues and registry reporting requirements are discussed among these individuals with supporting personnel from radiology, quality, and IT where needed. We also identify areas for quality improvement and research. The director of chest imaging manages the radiology requirements and Lung-RADS™ training, reporting process, surveillance letters, and oversees the processes in radiology for verification of screening criteria with each order. We have a direct notification system through our EMR to the ordering provider, primary care physician (PCP), and lung nodule program. If there is a Lung RADS™ 3 or 4 finding, the program navigator speaks directly to the ordering provider’s office to offer an appointment for management. All suspicious findings are discussed at our multidisciplinary clinical team meetings. We currently screen approximately 1,000 patients per year and have shifted the curve to early stage of diagnosis following close to three years of the program. CF: The PrimaCARE program is a hybrid program with decentralized referral and centralized tracking. Operations are managed by the pulmonary division. We have a steering committee that includes pulmonary (medical director and navigator), thoracic surgery, radiology, primary care, and administration at our practice and oncology and interventional radiology at our local hospital system. The committee meets regularly to review data and discuss strategy going forward. The steering committee reviews data and quality metrics and identifies areas for improvement, assesses PCP participation in LCS and barriers to participation, opportunities for education, and sets goals. We also review finances and discuss opportunities for complying with LCS CMS requirements in a fiscally responsible manner. Staff and physicians in the pulmonary office manage the day-to-day operations of the LCS center. Shared decision-making, and, where applicable, smoking cessation counseling is provided initially by the PCP. Patients also receive educational material at the time of their scan. We currently have approximately 600 patients enrolled. Full capacity is likely over 5,000. PM: The Cleveland Clinic’s LCS program is a centralized program accessible throughout our health system. Any provider can refer patients to the program. Patients are pre screened for eligibility then scheduled for a counseling and shared decision-making (SDM) visit as well as low-dose CT at one of seven sites blanketing Northeast Ohio. The multi-specialty and inter-disciplinary team has developed a standardized SDM visit, documentation including structured reporting, communication tools, and management algorithms for nodule and common nonnodule findings. Program personnel are trained to provide smoking cessation guidance. Multidisciplinary team led by pulmonary with close partnership with radiology. Data collection and reporting are assisted by internal registries. Approximately 2,500 patients have been screened with further growth anticipated. RSW/KS: The LCS program at Boston Medical Center has a hybrid structure to its program. There is the option of either decentralized referral (PCP conducts SDM and places LCS order) or centralized referral (PCP refers patient to an LCS/Pulmonary Nodule clinic for SDM visit and decision whether to proceed with screening; if yes, the sub-specialty clinic provider places LCS order). A coordinator notifies the referring provider directly and the referring provider communicates these results to the patient. Screen-detected findings can either be managed in a decentralized fashion by the referring provider (i.e., PCP orders follow up testing and referrals) or through the centralized LCS/pulmonary nodule clinic. The program has centralized tracking of the LCS results and follow up is managed by a multidisciplinary steering committee with co-chairs from pulmonary medicine and radiology. The program is additionally staffed by an LCS program coordinator who is a nurse practitioner and a patient navigator. Since March 2015, over 1,200 individuals have undergone baseline LCS. We currently screen about 90-120 patients per month. The steering committee meets quarterly to review LCS program metrics such as volume, proportion meeting eligibility criteria, Lung-RADS™ distribution, cancer outcomes, etc. We also discuss challenges that have arisen during implementation and day-to-day operations of the program, e.g., rolling out an EPIC best practice alert, increasing data capture from referrals outside the BMC system, etc. MKG: The program at Kaiser Permanente Southern California (KPSC) is decentralized. The SDM and LCS orders are placed by the PCP with limited centralized verification, scheduling or tracking. LCS exams at KPSC are ordered by primary care providers and pulmonologists using a standardized order set in the electronic health record. Providers are required to check boxes to confirm that the patient is asymptomatic, meets eligibility criteria, has undergone shared decision making, and has been referred for tobacco cessation treatment (TST), if a current smoker. The program is run by clinical chiefs of service in the radiology and pulmonary medicine, with input from primary care. We have a robust infrastructure at regional headquarters and individual medical centers to support data analytics and tracking. We perform approximately 4,000 LCS exams per year. The eligible population includes as many as KPSC 30,000 members. CAP/AW: The Mount Sinai LCS program is a centralized program. It is governed by radiology through the International Early Lung Cancer Action Program (I-ELCAP). This has been an ongoing screening program since 2010. We have used a protocol since starting screening in 1992 at the Weill Cornell Medical Center and have continuously updated it, with references, on our website (IELCAP.org). We have a database of 80,000 screening participants worldwide. At the Icahn School of Medicine, we are providing screening at all the clinical sites of the Mount Sinai Health System. The program will continue to expand as CT scanners are added with American College of Radiology (ACR) certification. Scheduling, reading, and tracking are done centrally by the ELCAP staff. Shared decision-making and smoking cessation sessions are provided by the faculty or a nurse practitioner. Smoking cessation has been part of our program since our initial publication on smoking cessation (in the context of CT screening) in 2001. We have a database of 80,000 screening participants worldwide. We are currently screening participants who are covered by Medicare/Medicaid and those who meet the expanded criteria. EMH: Northwestern Medicine (NM) is the clinical enterprise affiliate of Northwestern University Feinberg School of Medicine. NM consists of three regions (central, north, and west), each of which runs a hybrid clinical LCS program with decentralized referral and centralized tracking. In our central and north regions, the multidisciplinary LCS steering committee is centered in the radiology department, a continuation of our NLST structure. In our west region, the multidisciplinary LCS steering committee is centered in the oncology department. The regions cooperate on overall program strategy and quality initiatives. Since 2013, we have performed initial screens on approximately 2,200 individuals in our three regions. We anticipate our capacity for the three regions to be approximately 6,000 enrollees. GM: The NYU program is a centralized referral and tracking program. Patients are referred to the program internally via EPIC referral or by calling 1-800-NYULUNG. Once referred, the patient is contacted by the patient coordinator to set up an appointment. The CT scan is ordered and placed on hold until after the initial visit. In the initial visit, the patient is seen by the nurse practitioner and pulmonary attending physician to have a physical exam and further identify if they meet criteria for LCS. During the clinic visit, the patient’s individual lung cancer risk is determined. In addition, smoking cessation counseling is provided. 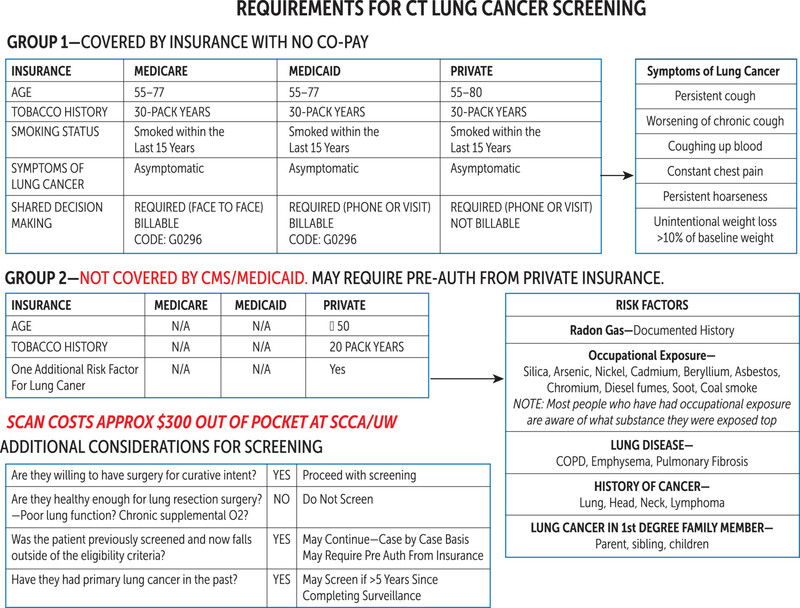 A balanced discussion of individualized risk and benefit of CT screening for lung cancer occurs and documented in the patient’s chart. If the patient meets criteria, they have the CT scan the same day and follow up is scheduled according to the CT reading. The NYU LCS Program provides recommendations and appropriate follow-up for pulmonary nodules as well as close collaboration with referring providers with any abnormal findings that require closer follow up or invasive procedure. Patient demographic, clinical and screening data is captured and logged into our secure, commerciallyAmerican available database. We have a steering committee consisting of thoracic radiologists (3), thoracic surgery (2), medical IT (1), pulmonology (5). We currently have more than 900 patients actively involved in our screening program. We are currently expanding to two additional sites. Our maximum capacity has not yet been established. EJ: The Ohio State University Early Lung Cancer Detection Clinic (ELCDC) is a combination of a decentralized referral with centralized SDM and orders for LCS and tracking. It is a novel all-inclusive screening lung cancer and smoking cessation program that is managed by pulmonary medicine in conjunction with medical oncology. Following patient referral dedicated nurses call each patient, ensure eligibility and schedule patients in one of two separate screening locations. LCS operations consist of a same-day 90 minute 4 step processes which are outlined here. During the first appointment, each patient will take part in a three-step shared decision-making process with a pulmonologist or pulmonary and critical care fellow. Once the decision to screen is made, the patient will then be immediately screened with a low-dose chest CT.
Low-dose computed tomography will be obtained immediately following the initial screening visit. The CT scanner is conveniently located on site making the transition from ELCDC clinic to radiology seamless. Positive screens are discussed by our multidisciplinary tumor board consisting of interventional pulmonary, pulmonary medicine, medical oncology, radiation oncology, thoracic surgery, interventional radiology and pathology. Establishment of policies and continuous monitoring of their proper implementation is owned by The Ohio State University James Cancer Center and Division of Pulmonary Medicine. The program is projected to perform 650 LCS scans this academic year (July 2017-2018). We have two locations. Both sites screen 6-8 patients per week. JM: The LCS program at Rush University Medical Center (RUMC) and Rush Oak Park Hospital (ROPH) is a decentralized referral and centralized tracking program. It is managed by a multidisciplinary team consisting of two thoracic radiologists, thoracic surgeons, a pulmonologist, multiple CT techs, and two program nurse coordinators (LCSC RN). Once the exam is ordered, the LCSC nurse will confirm the patient is eligible for their exam. Once a patient is confirmed eligible, they will complete their screening appointment at either RUMC or ROPH. After a patient has finished their exam, an LCSC RN will meet with them to address any questions regarding the exam, discuss smoking cessation and available smoking cessation resources if applicable, and invite the patient to participate in a research study being conducted by the medical center. After the exam appointment is complete, a thoracic radiologist will read and interpret the screening. Once the screening has been resulted, if the patient’s exam results in a lung RADS 4 exam finding, the thoracic radiologist will notify patient’s ordering provider, who will notify the patient of their results, and choose a treatment plan for the patient. After a patient’s exam has been resulted, if a patient has a negative exam or a Lung-RADS™ 3 reading, an LCSC RN will manually result the screening within the patient’s EMR to send to the ACR for tracking, and a result letter will generate from the EMR to be sent to the patient. The LCSC RN will then remind patient to come back for their exam annually. If a patient has a Lung-RADS™ 4 result, once the patient’s ordering physician has been notified by the thoracic radiologist, an LCSC RN will contact the ordering provider to offer navigation services, to help the patient schedule an appointment with thoracic surgery. The ordering physician may refuse the navigation service if they prefer another form of treatment. Lung-RADS™ 4 exams will be presented at a weekly MDC Chest Conference where a multi-disciplinary team of providers can view the scan and offer opinions for treatment. The LCSC RN oversees registry submission of all screening patients to the ACR, following patients and updating the ACR for one year after screening. The LCSC RN’s are also in charge of generating program metrics and promoting program growth. Since 2015, we have 504 patients enrolled in our screening program and 629 exams have been completed. Of the 629 exams completed, we have found 18 lung cancers and seven other cancers. Our goal is to grow the volume of our program by 5 percent in the next year, accruing at least 25 more screening patients to our program by November 2018. DTC: The UC Davis Comprehensive LCS Program (CLSP) is a hybrid program with decentralized referral and centralized tracking. It is a multidisciplinary collaborative for comprehensive LCS. To serve our patients in the program, we use a multidisciplinary team of radiologists, thoracic surgeons, pulmonologists, pathologists, medical oncologists, primary care doctors, smoking cessation experts and radiation oncologists to develop a best-practice, patient-centered plan. The program is led by a screening task force through a task force chair. The CLSP offers an LCS Shared Decision-Making Tool Kit to assist the referring provider at the point of care. Smoking cessation assistance is also offered through a myriad of patient centered tools. DKM: The LCS Program at the Seattle Cancer Care Alliance/University of Washington Medical Center offers the option of either decentralized referral (PCP conducts SDM and places LCS order) or centralized referral (PCP refers patient to the LCS Program) for SDM counseling and LCS order. The program has centralized verification, tracking of results, and smoking cessation counseling. It is managed by a multidisciplinary steering committee with representatives from pulmonary medicine, radiology, primary care medicine, thoracic surgery, marketing and administration. Central program staff in radiology and pulmonary medicine manages day-to-day operations with a dedicated commercially available LCS database. Over 750 individuals have undergone baseline screening with diagnosis of 24 asymptomatic lung cancers. The program estimated full capacity patient population is 2,300. CGS: The VA Portland Health Care System (VAPORHCS) LCS Program is a centralized program with orders performed by dedicated LCS personnel. It is a multidisciplinary collaboration of primary care, pulmonary, radiology, informatics, and thoracic surgery. Currently, about half of our primary care clinics are equipped to refer patients to our program, about 40,000 patients served by these clinics. KLS: The Vanderbilt University Medical Center is a centralized program and is governed by a multidisciplinary team. All patients undergo shared decisionmaking visits prior to their CT exam, most often performed by our clinical coordinator, a nurse practitioner with specialized training in LCS and smoking cessation. Since 2013, 1,000 screening CT examinations in more than 800 patients have been completed. We currently have approximately 700 patients enrolled in the program and estimate full capacity to be 3,000 patients enrolled. We have diagnosed more than 25 cancers, the vast majority of which have been early stage disease. Do you believe that an LCS program should be based in a specific department or practice, such as imaging, pulmonary, surgery, or oncology? MD: An LCS program should have a “home,” but at the same time it must be multidisciplinary. A home within imaging or pulmonary often makes sense; the core of LCS is based on imaging, and most evaluations that result from screening include small indeterminate nodules that are most often managed by pulmonary. Some institutions establish free-standing programs, while others establish programs within the context of other cancer screening, such as mammography. CL/AM: While this may be institution specific, the home base for the program seems the best fit in imaging with a multidisciplinary team having specifically defined roles and work flow, and most importantly a reliable navigator to maintain accountability for study results and confirmation of appropriate action and communication of those results. A decentralized system may provide easier access to the program, but will require a centralized system for tracking of mandatory reporting elements. CCT/KK: This is institution specific, although having a central home with coordination and tracking from that point between all members of the team and for the patient is crucial in running a successful program. Radiology defines the necessary elements of the study itself and assesses eligibility criteria for the study prior to performing it. There needs to be a centralized mechanism to intervene on suspicious findings through a multi-disciplinary team, and to maintain standards for quality as well as to track the many required data elements for registry reporting and program specific quality metrics. The home in our institution is in pulmonary given the need to follow pulmonary nodules over time and decide when intervention is necessary, review imaging with patients, and the management of non-malignant pulmonary conditions that lead to pulmonary nodules. This is also a good opportunity to perform shared decision making and smoking cessation counseling. Follow up frequency also requires more knowledge of the patient than the nodule characteristics seen on imaging. Referrals to diagnostics and treatment come from the pulmonologist who communicates with the navigator for care coordination and discussion with the multi-disciplinary team. Most alternate diagnoses are also managed by pulmonary, which allows the patient to connect with a caregiver for longitudinal care as well. There should also be a robust centralized surveillance system for follow-up of findings on the screening study, as well as criteria for ongoing annual follow-up. This is an area of risk to the patient and to the providers caring for these patients. A centralized process and a navigator are essential to this. Do you believe that an LCS program needs to have a program navigator? AM: Yes, we could not manage a population health program of this nature at our organization without program navigation. MD/RSW/KS: Most experienced programs have concluded that it is essential to have a program coordinator. High quality LCS requires attention to details, such as ensuring that only eligible patients are being screened and that patients actually get their screening studies, and any evaluation that comes from an abnormal study. Reimbursement is often dependent on a proper sequence of events—for example, shared decision-making visits must occur before screening studies. All this requires ongoing attention to details, most likely utilizing a data management tool. Without a program coordinator, these details can be overlooked. In addition, abnormal screening studies must be followed up. Nodules detected through screening that are not followed up only to later reappear as a more advanced lung cancer are a serious liability. The coordinator might be shared with other related activities. Some programs have a coordinator support the LCS program as well as an incidental lung nodule program. CCT: A program navigator is essential to provide care coordination for patients, to ensure education of providers and the community, and to assist with data management. Many navigators also work to ensure appropriate surveillance and reduce loss to follow up. In our program the navigator provides care coordination, outreach, smoking cessation, survivorship visits, and is the “glue” to patient care coordination efforts. She also manages the data collection of clinical care, and maintains educational materials on the program, tracks all diagnostic and treatment strategies, provides resources on nodules and lung cancer, as well as on shared decision making and smoking cessation. AR: Yes, preferably one who has clinical background (RN, LPN) with appropriate clerical/administrative support. CF: Yes. Our navigator’s work coordinating the program has been essential to our success. With appropriate coaching and scripting she has been able to do this exceptionally well despite not being an RN or LPN. Our program navigator reviews all referred individuals for appropriateness of screening, schedules exams, collects results and brings to lung cancer program physician for review, contacts patients and PCP’s by phone and mail regarding results, schedules necessary follow-ups, including pulmonary consults for positive scans, and communicates directly with PCP offices regarding patient results and compliance with screening. In addition to the navigator, the program director provides guidance and education to PCP offices. Who manages your program database and patients? Clinical or nonclinical? Nurse navigators from the cancer center, radiology assistants, pulmonary NPs, or other? CCT: Clinical staff who are familiar with the medical terminology and follow appropriate protocols and guidelines manage our databases. In our program, a nurse navigator manages the flow of patients in and out of the database and tracks necessary follow-up. She also tracks all clinical diagnostic and therapeutic care provided and follows process measures related to access and diagnostics. She intersects with other staff members in radiology, oncology, radiation oncology, and thoracic surgery who track oncologic diagnosis, stage, and outcome and transfers necessary information into the LCS program database. A surveillance database also maintained for the purposes of tracking annual follow-up of LCS studies. This database also houses follow-up for incidentally found nodules and nodules found on diagnostic chest imaging. SR/BM: This will vary from site to site. With the amount of work involved in managing a screening program, this would ideally be done by someone who is dedicated fulltime to the program and not doing it in addition to their other responsibilities. In our program, we have two non-clinical positions dedicated to the program due to our high volume; we did not want to create a bottleneck by having all patients see a clinical navigator prior to screening. However, if the volume allows, having a clinical navigator can be advantageous for shared decision making, smoking cessation, discussion of results, etc. What department the position comes from will also vary, though it should be noted that this is a radiology program above all else, as roughly 90 percent of patients will remain in the annual/interval imaging cycle and never see specialist services. CF: Our program coordinator, who is not a nurse, manages our database. We have pre-templated letters that we send out to patients, depending on CT result, and we also pre-scripted and coached our program director on phone calls to patients regarding results and follow-up needed based on CT result (after physician review of each case). We do have a goal of getting a nurse navigator so that they could do the shared decision making and smoking cessation counseling. How do the various personnel involved in your LCS program communicate with each other? AM/CL: Communication occurs through different methods. For an individual patient direct communication between providers and program navigators is required. For program management and oversight, every other month steering committee meetings, where radiology working group report outs and research committee report outs, are standing agenda items. Weekly program statistics are reported to the steering committee members through steering committee distribution list e-mail communication. Multidisciplinary weekly conference is an additional forum for communication to discuss Lung-RADS™ 4 findings and to develop consensus recommendations. These are then relayed to the ordering provider either directly (physician-to-physician) or with the nurse navigator in oncology to close the communication loop. MD/RSW/KS: Communication with the specialists involved in LCS, as well as patients and referring providers, is one of the most important functions of a screening program. Communication with referring providers and patients is often part of the screening coordinators role. Communication among the other components can occur in a variety of settings. Some programs have regular meetings of the screening radiologist, coordinator, and the key providers engaged in nodule management, often pulmonary or thoracic surgery, reviewing studies that might require extra follow-up or evaluation. One large program has found that these meeting are only needed every other week, can take as little as 20 minutes, are very instrumental in keeping the program cohesive and responsive, and can help expedite evaluations. Another forum for communication could be a regularly scheduled lung cancer conference or tumor board, where concerning screening studies are reviewed as a multidisciplinary group. CCT/KK: Communication occurs daily through specialists and the nurse navigator. The nurse navigator also visits patients receiving treatment and maintains relationships with each of these patients. Our team meetings include review of concerning new nodules and each element of their referrals and work-up to date including imaging, pathology, and therapy. Recommendations are communicated back to the managing provider. Our clinical database is another source of communication and monthly, year to date, and yearly comparisons are reported monthly at our Oncology Steering Committee meeting with key leaders in the organization, in oncology meetings, and in our steering committee multidisciplinary meetings. AR: Team communicates internally and with referring sources as well as with the state’s program by way of fax and EMR flags. CF: Personnel communicate primarily through EMR messaging but also through secure texting and email. In addition to our quarterly steering committee meetings, the program director and program navigator meet weekly or biweekly to review any problematic issues. All positive scans are also reviewed monthly at our tumor board. Are there models for LCS in rural areas with limited access to specialists experienced in lung cancer and LCS? MD: Very few LCS programs have included rural areas. To be most successful, LCS should be multidisciplinary and many areas may lack some of the key specialists such as pulmonary, thoracic surgery, and radiologists with experience in screening and thoracic imaging. Some programs have approached this by having a local nurse coordinator and imaging, filling the gaps by developing a specialized network of providers with regular teleconferencing with ability to review images together. This network can support the rural program through telemedicine visits with patients traveling to tertiary centers when needed for procedures and other highly specialized care. The principles of LCS remain the same: careful patient selection using accepted criteria, low-dose CT imaging, structured interpretation and reporting, and multidisciplinary management of pulmonary nodules and suspected cancers. Does your LCS program have a research committee? AM/CL/RSW/KS/CCT: Yes, it consists of all colleagues interested in program research initiatives. The research committee meets monthly and works to manage, coordinate, and assist one another with research activities relative to program and program database. The committee also updates stakeholders on research activities and identifies opportunities for future LCS progress. The research group serves to assist with prioritizing research within the institution and partnering with other institutions in collaboration. It also assists with reducing redundancy in project endeavors among a wide group of interests. CCT/KK: Yes, the program director leads a research and quality improvement team that evaluates priority questions and conducts projects along with residents interested in QI or lung cancer. The project consists of process, access, outcome, and surveillance questions important in LCS and care and meets 2-4 times per month. AR: Yes. Some of this is done in conjunction with the University of Delaware, especially around smoking cessation. There are also projects from our Value Institute looking into methods and effectiveness of SDM visits among PCPs. CF: As a program based in a community setting, not affiliated with an academic institution, we do not have a research committee at this time, although we would be open to developing one if the resources become available. In addition, we are collecting data that we would be happy to share. The Lung-RADS™ system is not consistently taught in radiology residency programs and requires radiologists undergo additional training to use the reporting methodology appropriately and effectively. Competent use of a standardized radiology reporting system can help keep LCS patients safe by avoiding unnecessary care escalation in the LCS population. Integrating an LCS program within the myriad activities of a radiology department requires careful coordination between clinical and administrative staff. Survey solutions to these issues can be found below. If your program has a radiology working group, what are their responsibilities? AM/CCT: The radiology working group sets the scanning protocols, ensures appropriate radiologist training, ensures program navigator, CT technologist and scheduler training, selects database, oversees day-to-day program functions and questions. The radiologist in charge handles daily questions on individual case level. The radiology working group is essential to work through our day-to-day issues, identify areas for improvement, and problem solve. At our center, the radiology working group consists of a lead radiologist, program navigators, CT scheduler lead, and radiology lead administrator. CCT: Yes, there is a radiology working group run by the director of the radiology portion of the LCS program. This group reviews criteria for low-dose CT screening, reviews eligibility criteria following the EHR order, and tracks volume and quality metrics within radiology. The director of the LCS program within radiology also communicates key program communication and reporting standards and sits on the steering committee. She trains other radiologists in standardized Lung- RADS™ reporting. The radiology director also coordinates without outreach efforts, educational programming for providers, and collaborates with the LCS program leadership to implement structured radiology reporting through the EHR system. CF: We started by getting agreement on a standardized report for all individuals undergoing LCS. Once consistent compliance with this was achieved, we revisited the concept of Lung-RADS™, the need for submission of data to an approved registry (tied to reimbursement) and the fact that currently only the ACR registry, which requires Lung-RADS™) is approved by CMS. With this, and assistance from radiology administration in the building of templates, compliance with standardized interpretation of LCS exam with use of Lung-RADS™ has moved forward rapidly with almost 100 percent compliance at this point. Do you have a specific internal credentialing process for the radiologists reading the LCS exams? If so what is the process? SR/BM: We have specific requirements for all radiologists interpreting LCS exams. Each new radiologist must be board certified and have completed an online commercially available LCS training course with a simulated workstation to report over 100 actual LCS cases. Following successful completion of the course, each radiologist is trained by one of the credentialed LCS readers on the appropriate use of the dictation templates and macros to construct the report with standard language. Once credentialed each reader must interpret 150 LCS exams per year to maintain credentialing. KLS: At our center, all LCS examinations are read centrally at the University Medical Center by a Radiologist with specialty training in thoracic imaging. Additionally, radiologists interpreting LCS examinations undergo additional one-on-one training specific for interpretation of LCS examinations including the use of Lung-RADS™. CCT: Our director of chest radiology is an integral partner in the LCS program. She works with us closely to ensure that radiologists meet the requirements of the ACR to read LCS studies. This includes that all reading radiologists have read or been involved in reading or supervising at least 300 chest CT exams in the prior three years. She reviews reports and is a day-to-day resources for interpretation of LCS exams. What metrics do you review to assess the performance of the radiologists interpreting the exams, how often do you make that assessment, and what benchmarks should be used? BM/SR: We review radiologist performance quarterly. Exams read by each radiologist are broken down by Lung-RADS™ result (including S positive results) and percentages are compared among all radiologists. Positive predictive value (PPV), suspicious predictive value (SPV), and cancer detection rate (CDR) are determined for each radiologist as well but require at least a three month follow-up period from the last interpreted exam to allow for adequate workup of suspicious findings. Existing benchmarks include metrics reported by the NLST and I-ELCAP research studies and limited reports from clinical LCS programs. RSW/KS/AR: We use quarterly review by the steering committee of breakdown by Lung-RADS™ results, aggregate data. There are no benchmarks in place to-date. DTC: A systematic review of radiology reports is reviewed by the task force. Recommendations for reporting improvement are then taken back and disseminated to faculty by the radiology director of LCS who is a member of the task force. CCT/KK: The program systematically reviews radiology reports for report of nodules, recommendations, and follow-up by the patient. Feedback is given to the radiology director of the LCS program and the chief of radiology. A quality report is developed by the program in conjunction with radiology and pulmonary. CF: All reports are reviewed by an LCS program physician (pulmonologist). Any concerns with interpretation are reviewed with program director immediately, who communicates with radiology director. Concerns are also reviewed with steering committee periodically. The effectiveness of an LCS program is dependent upon multiple factors. Similar to mammography, regular assessment that quality metrics and objectives set forth by the steering committee are met and deficiencies are addressed in a timely fashion is necessary. Examples of approaches to these issues from various institutions are found below. The insurance landscape for LCS is complex. The Affordable Care Act mandates all private insurers must provide no co-pay coverage for all USPSTF Grade A and B recommendations, including LCS for the USPSTF defined high-risk population. Unfortunately, the CMS and USPSTF high-risk groups are slightly different, often leading to confusion when determining patient eligibility. Further complicating the matter are society recommendations which expand the high-risk group beyond the USPSTF and CMS eligibility criteria. These issues and others are addressed by the responses below. What is required for reimbursement for LCS? AM/SR: An overview of insurance requirements for Group 1 and Group 2 criteria is summarized in this table. CCT: It is important to understand each of these requirements by insurance provider to ensure reimbursement. Required elements for documenting eligibility are hard coded into the LCS exam order within the EHR. These criteria are verified at the time of imaging by the radiology center using standardized forms. Below is a practical summary of the rules for performing and billing for these screening services. What are the differences in criteria for screening between private insurance, Medicare and Medicaid? GM: LCS coverage varies widely depending on the plan. The most common plans are outlined in the accompanying table including criteria for coverage, cost-sharing i.e., fees paid by the plan member as well as additional costs such as physician or facility fees. It is recommended to contact the insurer directly for coverage questions in advance of providing LCS services and obtain a pre-authorization to ensure reimbursement. *If plan grand-fathered under Affordable Care Act then coverage not required. *May cover beyond age 77 depending on plan. May be pre-determined facility or providers. Counseling visit to discuss need for lung cancer screening (LDCT) using low-dose CT scan (service is for eligibility determination and shared decision making). Most programs have a process of education and outreach to inform the provider community about eligibility criteria, the process for ordering an LCS study, or the referral process to the LCS program including who will subsequently manage the shared decision making discussion, CT scan, and subsequent management and follow up of exam findings. How is the provider community engaged in the LCS program? JM: Education can take many forms: grand rounds presentations, visits to offices, newsletters, web overviews and decision aids, on-hold messages, health fairs, and journal articles are examples. Education efforts should be multifaceted and repeated over time, particularly early in a program’s existence. The primary care champion for the program can provide guidance about the most effective means of communication with the primary care group. Automated reminder systems can be built into many EHRs that can serve to educate the ordering provider. AM: We began by assisting primary care through an education campaign consisting of face-to-face meetings with PowerPoint presentations to inform practitioners of the characteristics of patients who are at high-risk for lung cancer. During these visits, we provided office materials that could be used by medical assistants to identify the high-risk population as well as shared decision-making tools to assist in performing these conversations. PM/RSW/KS/CCT: Our program focused on educating the community of providers who will refer patients for screening. Education can take many forms: grand rounds presentations, visits to offices, newsletters, web overviews and decision aids, on-hold messages, health fairs, and journal articles are examples. Education efforts should be multifaceted and repeated over time, particularly early in a program’s existence. The primary care champion for the program can provide guidance about the most effective means of communication with the primary care group. Similar education and marketing efforts targeting potentially eligible patient populations should also be considered. Patient education tools in the form of pamphlets, call-lines, internet resources, and letters can be considered in conjunction with marketing experts. CF: The screening program educates PCPs regularly regarding criteria for eligibility, components of shared decision making and smoking cessation counseling. This is done twice a year at regular group meetings which most of our PCPs attend and also plan for the program director to do site visits to individual PCP offices to provided education. We have a brochure that we provide to PCP offices for patients as well. How do you address physician concerns about LCS at your site? Provide information and tools to address physician concerns. Educate clinicians on time involved with shared decision-making discussion. Review screening results in NLST and your program. Inform clinicians of rate of invasive intervention for benign disease. Describe referring MD involvement to follow-up for incidental findings. Discuss radiation exposure for follow-up imaging. Review cost potential for follow-up tests and interventions. Address AAFP lack of endorsement for screening. Assist PCPs through EHR and office work-flow to identify high-risk population. Prepare primary care to conduct shared decision-making discussion. Review evidence of screening results across disease sites. Show broad society support for LCS. Education (as noted above under 3F), including site visits to offices to review purpose and process and answer questions. Examples of shared decision making tools provided, as well as links to online tools. Educational video. One of our PCP’s made a video that patients can watch and then discuss with their provider. PCPs encouraged to contact program directly with any questions or concerns. Emphasize LCS program commitment to make sure ordering provider aware of all abnormal results that need followup even if not a positive lung cancer screen. How do you promote LCS with physicians? Screening program personal visits PCP, pulmonary, cardiology, and ob/gyn practices. Grand rounds, noon conferences, and medical leadership presentations. Regular bulletins with program quality metrics and latest updates to referring physician practices. Emphasize additional health benefit for increased smoking cessation and reduced relapse rates for those in an LCS program. Having a resource or “go to” person that is readily responsive for PCP support. Provide informational materials for exam rooms and handing out, including emergency rooms, urgent care sites, radiology, PFT lab, pulmonary and cardiac rehab, inpatient rooms (see Resource Section). PCP representative on LCS steering committee and lung nodule team. Hospital-wide e-mail on pertinent topics each month including LCS. Physician outreach via grand round presentations for various specialties, visits to primary care sites. Website and postings on our health system’s provider intranet. 0.5 credit CME educational video that we have distributed to care providers. Grand rounds presentations at BMC and affiliated community health centers. LCS Program website. The website includes general information, patient education materials, and a healthcare provider information page with links to background reading (e.g., original research articles, LCS guidelines), instructions for ordering LCS, local resources, and contact number for further information. EPIC best practice alert to remind healthcare providers when a patient is eligible for LCS, with associated instructions for how to order LCS (e.g., reminder about eligibility criteria, shared decision-making). Working with administration to generate a list of potentially eligible patients from our EMR that will be provided to PCP’s with emphasis on the importance of determining true eligibility and engaging in a shared decision making discussion regarding screening with appropriate patients. This list can also be used to identify patients that need smoking cessation counseling, regardless of risk for lung cancer. Making sure PCP’s aware of reimbursement for shared decision making and appropriate billing codes. How do you raise awareness about LCS in your community? CCT: Education is the key to marketing to the healthcare community and to patients. Educational materials which include information about the program, team members, contact information, referral and follow-up process, eligibility criteria should be developed and targeted to the provider community. These can be delivered through educational sessions and through mail, in-person delivery, and posters/emails. Patient education tools in the form of pamphlets, call-lines, internet resources, and letters can be considered in conjunction with marketing experts. Automated reminder systems can be built into many EHRs to market the program to the provider community at the point of care. Many programs have a navigator who can visit practices and engage with providers and the community through health fairs and community events. Attend community events—table with pamphlets and giveaways.